The sentence. 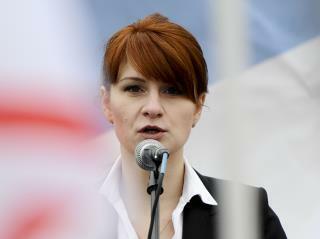 Butina faces a maximum of five years in prison on the conspiracy charges, though she is expected to serve much less under the deal, which still has to be approved by a judge. Her lawyers are asking for a maximum of six months, CBS News reports. The charge is a felony, so the 30-year-old will likely be deported when she is freed. How long did they torture her? A good message for all the other Russian spyhunds operating within our borders.